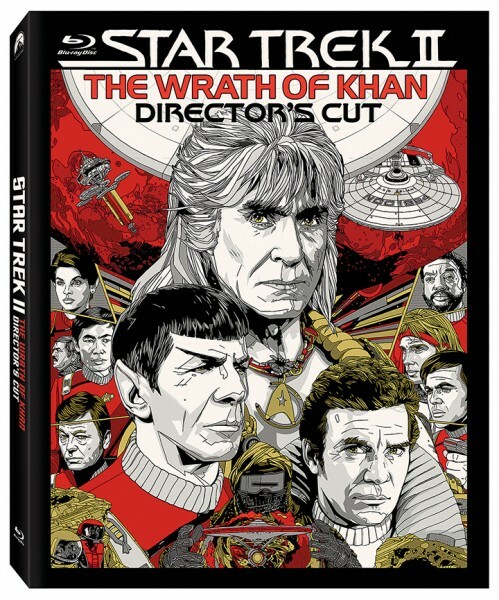 Paramount Home Media has announced the release of Star Trek II: The Wrath of Khan Director’s Edition to Blu-ray Disc. This is the first time the director’s cut of the film will be available on Blu-ray (although previously released to Digital HD), and will include a brand new making-of documentary along with over two hours of bonus features. The Director’s Edition will hit shelves on June 7th, 2016 celebrating the 50th anniversary of the Star Trek franchise that debuted as a television series in 1966. The new documentary titled “The Genesis Effect: Engineering The Wrath of Khan” chronicles the development and production of ‘Wrath of Khan’ with archival footage, photos and new interviews. Previously released bonus content includes original interviews with William Shatner, Leonard Nimoy, Ricardo Montalban and DeForest Kelley. Visual effects, the film’s music score, and storyboards are also detailed. The edition will include both Nicholas Meyer’s director’s cut and the original theatrical version. If anyone’s got some information on the cover art please let us know in the comments.